Now You Can Make Money By Creating and Sharing Content. 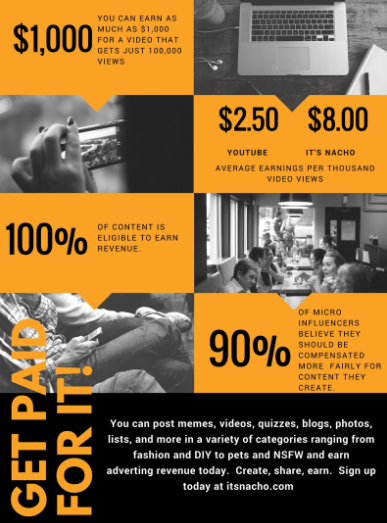 It’s Nacho is looking for great content creators. Are you able to produce content that connects with a primary audience of 15 – 25 year-olds? (Of course many of our viewers fall outside that range.) Can you entertain and/or inform on timely topics in a variety of categories such as entertainment, celebrity, lifestyle, sports, tech, cars, etc.? Then, It’s Nacho is looking for you. 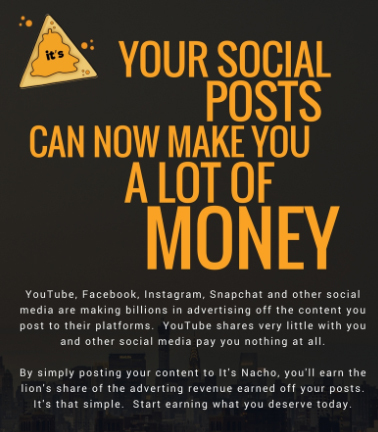 If you want to make money simply by creating good content, It’s Nacho pays higher CPMs and has a greater rev share than YouTube. Now you can actually make real money from your videos and blogs. Contact us and, if approved, we will set you up with an account that includes a bio, picture, and a link to your channel/blog/website and a Facebook like box (if desired). We are looking for active content creators with the gift for thinking outside the box. It’s Nacho wants to be legendary, Nachordinary! We are looking for 1 or more posts a week in the form of, blog, Vlog, list, ranking, infographic, video, etc. Bloggers and content creators will receive an added cash incentive to provide great content. We reserve the right to delete content that is under-performing, as this will help limit sub-par and/or spam blogging. THIS AGREEMENT executed on 04/18/2019, by and between YOUniversity, LLC (hereinafter “Company”), and (hereinafter “Contractor”). 1.1 Term. Company agrees to hire Contractor, at will, for a term commencing on 04/18/2019 and continuing until terminated in accordance with Section 4.
a. Compose a minimum of two (2) informational and/or entertaining Blogs per calender week. These Blogs must be published directly on the It’s Nacho website, currently located at youniversitytv.com, by clicking on the “Create” button and submitting a Story. Submitting a story will require the Contractor to create a user account on It’s Nacho. a. Contractor should include a small Bio about the author below the main text of the Blog. b. Contractor may include a link in the Bio to the author’s personal Blog page. c. Blogs published to It’s Nacho must be unique and exclusive to It’s Nacho. Contractor will only publish Blogs to It’s Nacho that the Contractor has full, legal rights and authority to publish. Blog’s published by Contractor to It’s Nacho may not be published elsewhere without written consent from a duly authorized representative of It’s Nacho. f. Contractor will promote their Blogs posted to It's Nacho on Contractors personal social media channels. Contractor further agrees that in all such aspects of such work, Contractor shall comply with the policies, standards, regulations of the Company from time to time established, and shall perform the duties assigned faithfully, intelligently, to the best of his/her/their ability, and in the best interest of the Company. 2.1 Confidentiality. Contractor acknowledges and agrees that all financial and accounting records, lists of property owned by Company, including amounts paid therefore, client and customer lists, and other Company data and information related to its business (hereinafter collectively “Confidential Information”) are valuable assets of the Company. Except for disclosures required to be made to advance the business of the Company and information which is a matter of public record, Contractor shall not, during the term of this Agreement or after the termination of this Agreement, disclose any Confidential Information to any person or use any Confidential Information for the benefit of Contractor or any other person, except with the prior written consent of the Company. 2.2 Return of Documents. Contractor acknowledges and agrees that all originals and copies of records, reports, documents, lists, plans, memoranda, notes and other documentation related to the business of the Company or containing any Confidential Information shall be the sole and exclusive property of the Company, and shall be returned to the Company upon the termination of this Agreement or upon the written request of the Company. 2.3 Injunction. Contractor agrees that it would be difficult to measure damage to the Company from any breach by Contractor of Section 2.1 or 2.2 and that monetary damages would be an inadequate remedy for such breach. Accordingly, Contractor agrees that if Contractor shall breach Section 2.1 or 2.2, the Company shall be entitled to, in addition to all other remedies it may have at law or equity, to an injunction or other appropriate orders to restrain any such breach, without showing or proving actual damages sustained by the Company. 2.4 No Release. Contractor agrees that the termination of this Agreement shall not release Contractor from any obligations under Section 2.1 or 2.2.
c. $0.05 for each subscription to Company Newsletter as a result of Contractor’s Blog. d. Fifty percent (50%) of advertising revenue earned directly on Contractor's published Blog post pages. 3.2 Withholding; Other Benefits. Compensation paid pursuant to this Agreement shall not subject to the customary withholding of income taxes and other employment taxes. Contractor shall be solely responsible for reporting and paying any such taxes. The Company shall not provide Contractor with any coverage or participation in the Company’s accident and health insurance, life insurance, disability income insurance, medical expense reimbursement, wage continuation plans, or other fringe benefits provided to regular employees. Compensation will not be distributed to Contractor until a minimum sum of twenty-five dollars ($25) has been accumulated. Additionally, each subsequent check will be distributed upon accumulating another minimum sum of twenty-five dollars ($25). 3.3 Expenses. Company shall reimburse Contractor all reasonable and necessary expenses incurred by Contractor in connection with the performance of his duties hereunder, provided, the President or Managing Director of the Company has approved such expenses in advance. 4.1 Termination at Will. This Agreement may be terminated by the Company immediately, at will, and in the sole discretion of the President of the Company. The contractor may terminate this Agreement upon fourteen (14) days written notice to the Company. This Agreement also may be terminated at any time upon the mutual written agreement of the Company and Contractor. 4.2 Death. In the event Contractor dies during the term of this Agreement, this Agreement shall terminate, and the Company shall pay to Contractor’s estate the salary which would otherwise be payable to Contractor. Contractor acknowledges that he is an independent contractor and is not an agent, partner, joint venturer nor employee of Company. Contractor shall have no authority to bind or otherwise obligate Contractor in any manner nor shall Contractor represent to anyone that it has a right to do so. Contractor further agrees that in the event that the Company suffers any loss or damage as a result of a violation of this provision Contractor shall indemnify and hold harmless the Company form any such loss or damage. Contractor represents and warrants to the Company that there is no employment contract or other contractual obligation to which Contractor is subject which prevents Contractor from entering into this Agreement or from performing fully Contractor’s duties under this Agreement. 7.1 The provisions of this Agreement shall be binding upon and enured to the benefit of the heirs, personal representatives, successors, and assigns of the parties. Any provision hereof which imposes upon Contractor or Company an obligation after termination or expiration of this Agreement shall survive termination or expiration hereof and be binding upon Contractor or Company. 7.2 In the event of a default under this Agreement, the defaulted party shall reimburse the non-defaulting party or parties for all costs and expenses reasonably incurred by the non-defaulting party or parties in connection with the default, including without limitation, attorney’s fees. Additionally, in the event a suit or action is filed to enforce this Agreement or with respect to this Agreement, the prevailing party or parties shall be reimbursed by the other party for all costs and expenses incurred in connection with the suit or action, including without limitation, reasonable attorney’s fees at the trial level and on appeal. 7.3 No waiver of any provision of this Agreement shall be deemed, or shall constitute, a waiver of any other provision, whether or not similar, nor shall any waiver constitute a continuing waiver. No waiver shall be binding unless executed in writing by the party making the waiver. 7.4 This Agreement shall be governed by and shall be construed in accordance with the laws of the State of Florida. 7.5 This Agreement constitutes the entire agreement between the parties pertaining to its subject matter and it supersedes all prior contemporaneous agreements, representations, and understandings of the parties. No supplement, modification or amendment of this Agreement shall be binding unless executed in writing by all parties. I, the above signed, swear under penalty of perjury, that I am legally authorized to enter into and consent to the terms of the Blogger Agreement. Type your full legal name. Signature valid as original.